Collection of The University of Queensland, purchased 2007. Taking as its point of departure Christo and Jeanne-Claude’s Wrapped Coast 1968–1969, in site: process, performance, documentation juxtaposes Australian experimental art practice from the 1960s and 1970s with more recent artworks that explore related ideas. Exhibition co-curator Samantha Littley has provided some thoughts about one of the exhibition’s key artworks that will be recreated on the Forgan Smith lawn, just prior to the opening of in site: process, performance, documentation and Robert Smithson: Time Crystals on 9 March 2018. We’re looking forward to restaging Clive Murray-White’s ‘Smokework’ (then titled ‘Smokebomb sculpture’) 1971 at the opening of ‘in site’ and ‘Robert Smithson: Time Crystals’. Artists in the 1960s and 1970s were working at a time when art was becoming more conceptual, and being taken out of the gallery space and into the environment. 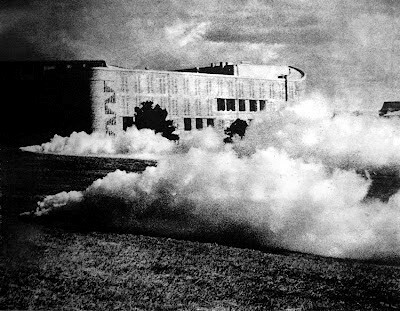 Staged on the grounds of The University of Queensland, the 1971 iteration of ‘Smokework’ was designed to immerse viewers in a visual encounter that challenged preconceived perceptions of art, and was representative of a broader international movement that privileged ephemeral and experiential practice. Murray-White had previously presented the artwork in 1970 at the University of New South Wales, however, it was a first for Brisbane audiences. An early example of ‘Situation Art’ or ‘Post-Object Art’, it comprised eight smoke-generating canisters that produced billows of smoke that obscured surrounding buildings. In Murray-White’s words, ‘it was about obliterating the horizon line so that, perceptually, the sky above one and the ground immediately at one’s feet joined’. Contemporary commentator Juliana Enberg has pointed to correlations between the artwork and the demonstrations that protested against Australia’s involvement in the Vietnam War, when tear gas was used to disperse crowds. A banner featuring a still image from the original 16mm film of Smokebomb sculpture is included in the exhibition. Those attending this restaging should make sure they arrive early, as we anticipate the performance lasting only seven minutes, as did the original work. in site: process, performance, documentation will run from 10 March – 5 August 2018 at UQ Art Museum. Visit the UQ Art Museum website for further information. Tags: Clive Murray White. Bookmark the permalink.